Chilly weather? Time to go shopping in Bucharest! Happy autumn to you! Remember that a new season is upon us, which (sadly) means it’s time to change our wardrobe and cover up the beautiful summer tan. Gone are the days when wearing sandals, tank tops and short trousers was a good idea for an outfit; the weather is getting a bit chilly, and it’s a must to have something long sleeved to wear in the cool evening. A shopping spree is definitely coming up, but did you ever consider going on a trip for shopping? If so, then shopping in Bucharest might be the perfect idea for September. Why? Because Bucharest is a great place to visit, and there are so many places to shop here, from malls to street shops with internationally well known brands, to local designer boutiques and more; fashion fairs are frequently happening on weekends in Bucharest. Also, a trip means staying in a stylish and well prepared accommodation, where you will have all the comfort you need to feel relaxed and happy. Sounds good, doesn’t it? Go ahead and pack lightly and get prepared to go shopping in Bucharest! This colorful season should be celebrated with an adventure in an eclectic city, where gorgeous sights and great fashion are always in style. From the windows of Concorde Old Bucharest hotel, you can see Unirea, one of the oldest shopping malls in the city. Unirea Shopping Center is located in a central square, in a very busy area. Bus stations, taxis and two subway lines have stops here, making Unirea a very popular shopping destination. This shopping mall has various stores, and here you will find clothing, cosmetics and shoes from popular brands. The Bucharest Mall is located 3-4 kilometres away from the old city and it is the first mall built in the city. It’s still an attractive place for shopping in Bucharest, with its many stores, food courts and cinemas. Also, here you can find a casino called Game World. If you’re feeling lucky, enjoy some casino games and win big! AFI Palace Cotroceni is a very popular mall in the city, as it is bigger than the Bucharest mall and it also has an ice skating ring all year! You can get there by taxi or an Uber car, or take the subway to Politehnica station. From the subway, it’s just a 5 minute walk to AFI. Explore the city while shopping in Bucharest! 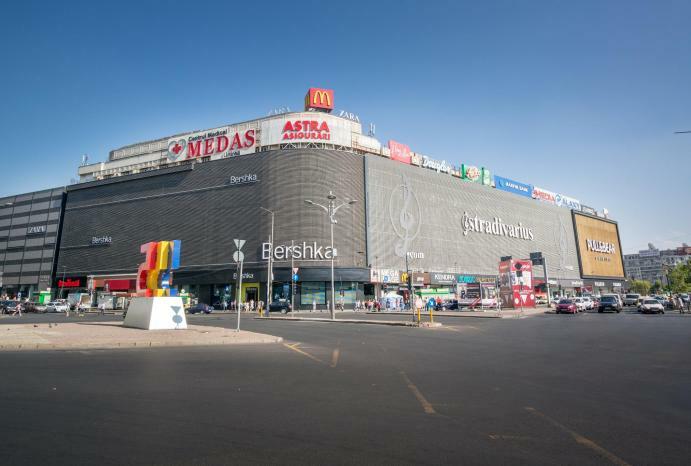 Băneasa mall and Park lake mall are some of the most modern and popular shopping centers in Bucharest. At Park Lake, you will discover a beautifully decorated place, where you can shop for international brands, eat in various restaurants and see recent films at the Cinema City movieplex. But, more importantly, at this mall you can enjoy a pleasant walk - as its name suggests, outside the mall you will find a large lake and a nice park. Park Lake is a great place to spend a whole day at, combining shopping with a pleasant walk in the park, admiring nature! Băneasa Shopping City is situated in the Northern part of Bucharest, close to the airport, making it the perfect place for some last minute shopping before your flight. Public transportation is close by, and around the mall you can also shop at Ikea, Carrefour, Mobexpert or Decathlon. This upscale mall has many international brands and a great playground for kids, making it a great place for all ages. If you want to shop for designer clothing, there are some multi-brand stores you can visit, such as Mengotti, Fashion Victim, The Place X, Victoria 46 that sell designer clothes and luxury items from Karl Lagerfeld, DSquared 2, Fendi and many more. Shopping in Bucharest will thrill you, because you have so many options! Your new wardrobe will definitely not go unnoticed. Molecule F sells Romanian design brands, such as Venera Arapu, Murmur, Ioana Ciolacu, Răzvan Ciobanu - you simply must check them out! V for Vintage is a contemporary design and vintage culture fair happening in November. If you love vintage design, make sure to come at the fair this autumn! While shopping in Bucharest, don’t forget about souvenirs! At the Romanian Peasant Museum’s gift shop, you can find authentic Romanian souvenirs like tastefully painted cups and plates, clothes and decorations. Visit the museum and discover our culture, then don’t forget to visit the gift shop! The Old City has a lot of souvenir shops you can visit as well. Like we’ve mentioned before, the old city is a very popular area for shopping, eating and partying, and also sightseeing. Concorde Old Bucharest hotel is the perfect accommodation for tourists who want to taste the culture and entertainment of Bucharest. Located here, in the old city center, on the oldest paved street in the city - the French street - this hotel strikes just the right balance between comfort, style and authenticity. If you visit us in autumn, we have some suggestions that will make your stay even more pleasant. Book now a perfect room for your trip to Bucharest and let the adventures begin! Immerse yourself in the local culture and experience both the old buildings and streets, and find entertainment and the joy of shopping in Bucharest in modern stores and malls.